Khanom Krok is one of, if not THE, favorite food of mine. Every time I visit home, my mom will ask “should I get you Khanom Krok from the market?” It’s more of a hypothetical question to which she already knows the answer. Khanom Krok is a Thai snack that is commonly found on the streets of Thailand. This cute custardy cake is filled with coconut milk and cream, rice flour, salt, sugar and cooked rice (some recipes omit the rice, but I find it helps set the custard better). The essential ingredient, which is quite hard to find is red lime water (or Nham Pboon Sai in Thai). I tried the recipe with and without. The one with red lime water is far more superior. Red lime water, in case you are curious, is calcium hydroxide mixed with powdered turmeric to make the colour red. Once you dissolve red lime with water, the red limescale will settle at the bottom. The clear water on top is what you use for cooking. This secret ingredient helps make the skin of the cake crispy. You can find red lime in most markets in Thailand. But if you live abroad, only a handful of Thai grocery stores carry them. 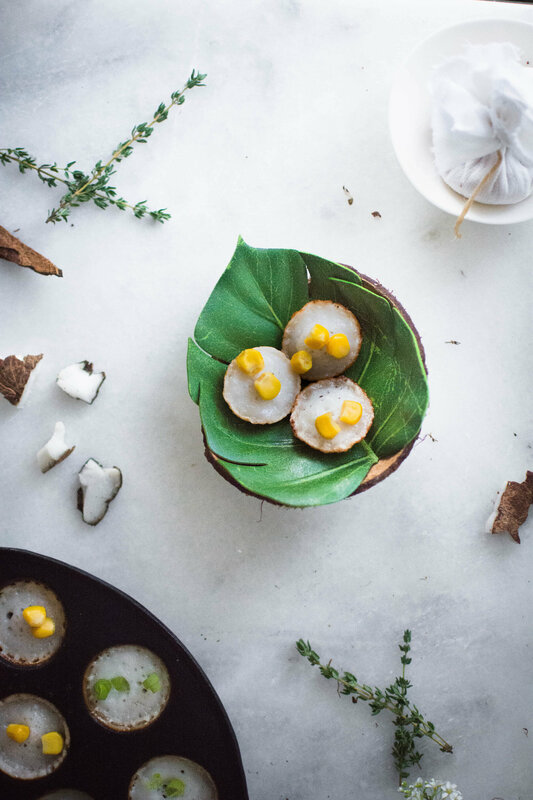 Khanom Krok is fairly simple to make, but it requires a few special techniques to make the texture just right. Don’t let the pretty pictures fool you. I attempted to make Khanom Krok three times over two weekends to get it just like the ones I found on Bangkok streets. First, you need the right pan. Luckily I have Poffertjes pan (mini Dutch pancake) which is similar to a Kranom Krok pan. The pan needs to be seasoned properly. I learnt through research that one must cook the eggs or coconut meat on the pan first and leave it completely burnt. I don’t quite know the science behind it but I assume the heat helps open the ‘pores’ of the pan so the oil from the food can seep into the pan for a better non-stick effect. In the end, I managed to replicate my favorite dish. I wonder what brought on my obsession for Khanom Krok. I guess for me it has all of the characteristics that I like…almost like my idea of a classy woman - simple, unassuming, pretty (perhaps she doesn’t quite know she is), not trying too hard and more importantly filled with goodness.